FOAM FUN. SEE MY HOPPER IN THE UPPER RIGHT? I Don't have the PDF or article link for this one but I do have the way to purchase it linked to the image on the left. 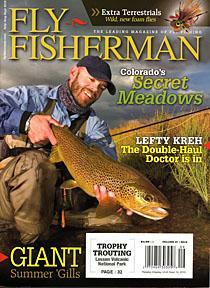 If you click on the cover it will take you to Fly Fisherman's store to buy it. This article was rattling around for several years before Fly Fisherman bout it from me. It talks about fun with foam and tying my VW Hopper, Herbie and Glo-Ant patterns as well as the life cycles and a ton of other information about fishing terrestrials that has never been published, not just the same old fish em' when it's warm and windy article, I explain why!